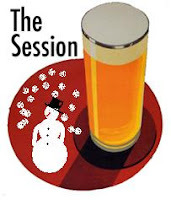 For those of you who don’t know, the Session is a monthly series of communal beer blogging, whereby all the beer bloggers write on the same topic at the same time. This month is hosted by Barley Vine. I’ve been on a winter beer spree this season. I have sought out many winter beers, and tasted all that I’ve found. Some I have posted here on my own blog, and some have just been posted on BeerAdvocate. 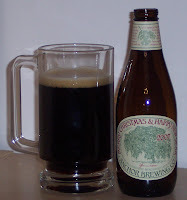 Every year since 1975, the great and venerable Anchor Brewing Company makes a Christmas Ale. Many brewers follow the same tradition. One thing that I find very interesting about Anchor is that they make the recipe different each year. They also change the label each year, with each year sporting a different tree. The whole story is there on the Anchor web site, behind the above link. Anyway, I knew that my series of winter beer tastings would be incomplete without getting a shot at this famed classic. I’ve made a real point this season to get my hands on as many winter seasonal beers as I can. It’s been really fun trying all the different ones, to see each brewer’s individual take on what it means to be a holiday or winter beer. Some have been similar to each other, and some have been unique to themselves, but none have dissapointed. As I taste each one, I imagine a food that would go great with each beer. A lot of times it comes up with the old standards: barbecue, or stew, or mexican, or whatever old normal thing you’d think of with a beer. Tonight I found myself somewhat inspired. ‘Tis the season. 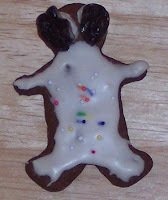 OK, well ‘tis nearly the season. At least it is cold enough to be the season here in Connecticut. Furthermore it is dark early enough to be the season. But rather than wallowing in self-pity as the days get shorter and colder, this is a time of year to celebrate. 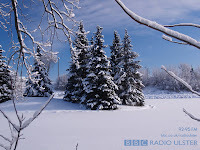 It is a time to get ready to hunker down and get warm in our homes. For those of us that live with beer, it is time for winter warmers!